OVERVIEW:This very successful 54‐foot sensible design not only offers a great three cabin luxurious layout, but QUALITY TIME easily cruises in the mid twenty knot range with a top speed of 35 knots! 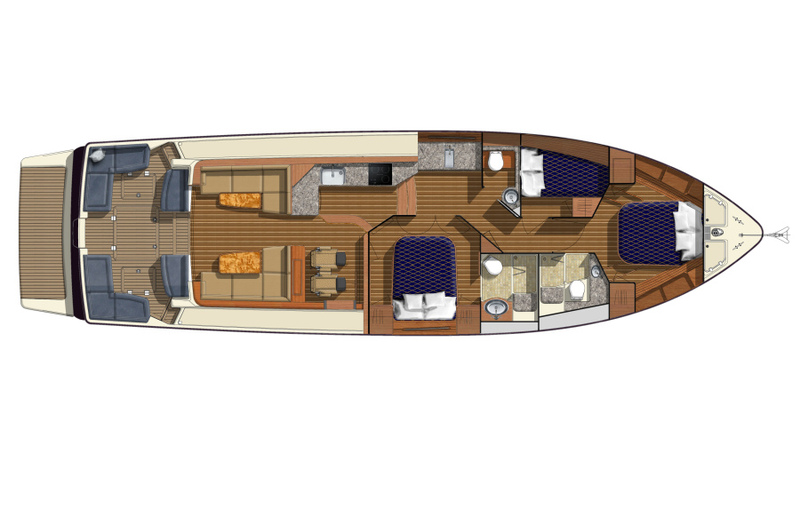 The low sound levels at the helm will be greatly appreciated at all speeds plus the logical, well designed and proportioned interior will impress the most experienced yacht owners. 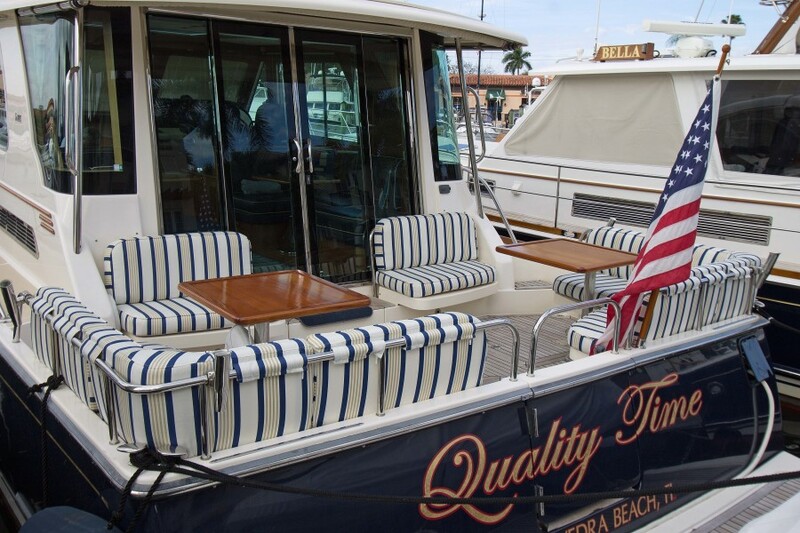 The clever utilization of all the interior spaces, elegant woodworking plus pleasing proportions all add up to a memorable boating experience...one that you must see to believe, so make plans to getaboard QUALITY TIME. 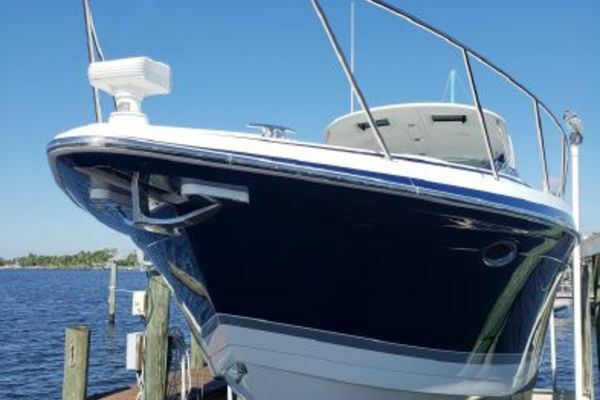 United Yacht Sales New Jersey would love to guide you through a personal showing of this 54' Sabre Salon Express 2014. 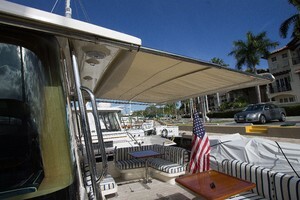 This yacht for sale is located in Ponte Vedra Beach, Florida and priced at $1,125,000. For a showing please contact us by filling out the form on this page and we will get back to you shortly! Volvo IPS II 850's with Dynamic PositioningGarmin Glass Bridge Electronics PackageFreedom Dinghy LiftSureShade Retractable Cockpit AwningFive Zone Marine Air Reverse Cycle A/C SystemImpressive Satellite Driven Entertainment SystemsPlus, everything you ever wanted in a cruising boat this size! The salon is entered from the cockpit through double stainless steel framed sliding doors. First impression is one of the light and brightness of the salon. With large surrounding windows and an electrically controlled sunroof overhead, the sense of space is dramatic and inviting. To port and starboard are luxurious U‐shaped Ultra‐leather settees and beautiful cherry wood hi‐lo tables with an elegant high gloss finish. 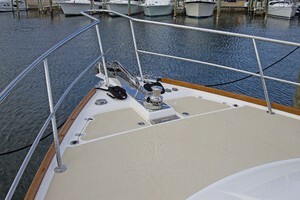 The starboard table raises and lowers electrically. 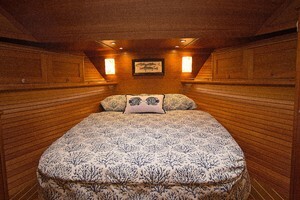 The starboard settee can be converted to an additional double berth. 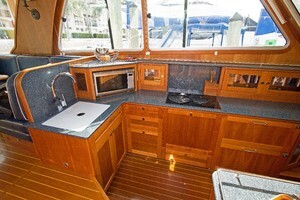 At the helm station twoStidd helm chairs are mounted on a cabinet containing an icemaker, glass and bottle storage and a large LED television on an electric lift. 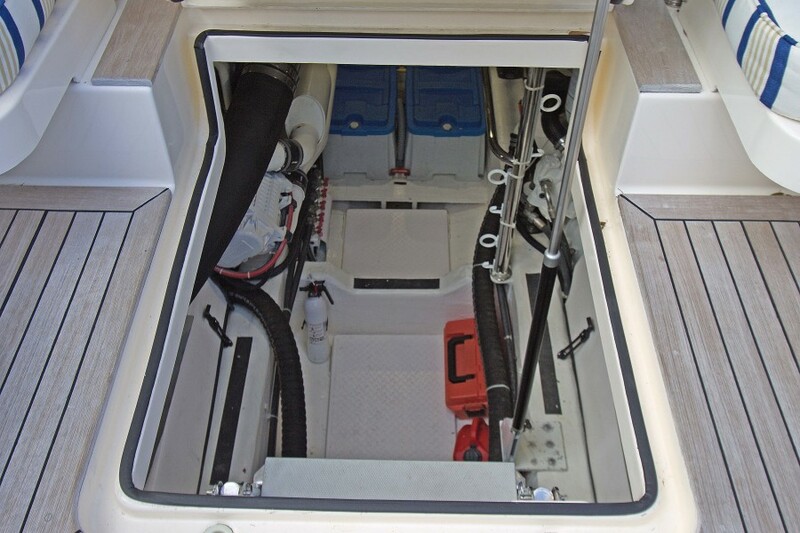 Outboard of the helm is a weatherproof, hinged door providing direct access to the side deck from the helm station. 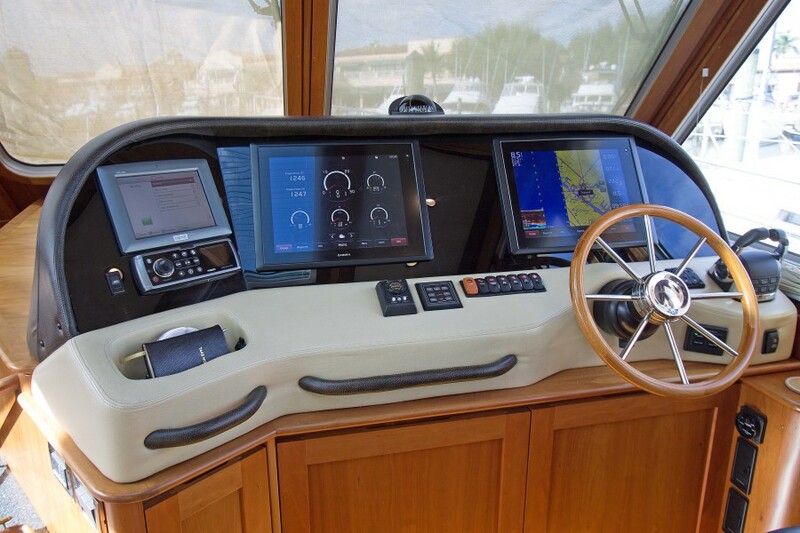 The navigational instruments pod is large and offers adequate space for multiple screens as well as the Volvo Penta engine controls. 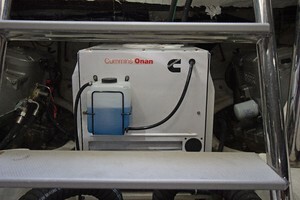 The Volvo Penta joystick is mounted on the helmsman’s armrest.The unique galley is laid out on two levels. 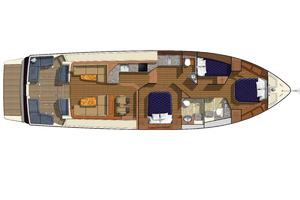 The upper level is directly connected to the helm, main salon and the social center of the yacht while the lower level offers additional refrigeration and freezer capacity as well as additional storage. Her galley offers an electric induction cooktop, deep stainless‐steel sink with designer faucet, Fisher Paykel dishwasher and four Sub Zero fridge/freezer drawers. 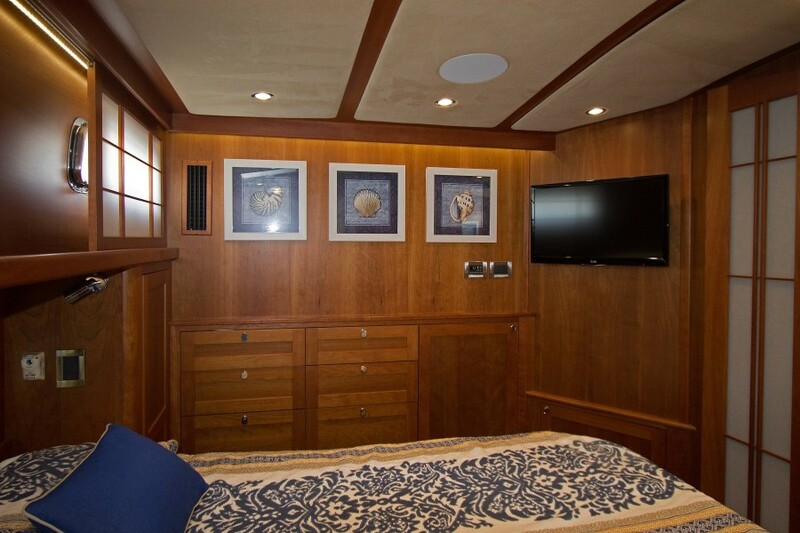 Countertops are created from Viatera quartz.Forward of the galley to starboard, the master suite is accessed through double Shoji style passageway doors which open to a large and welcoming stateroom. 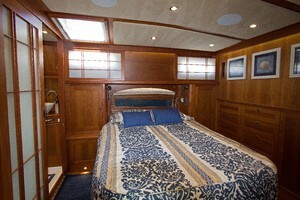 The master cabin is amidships, where wave noise and motion are at a minimum. A hull port above the head board allows light from the water to reflect into the cabin, where a comfortable queen‐sized berth is surrounded by wood working details that can only be created by boat builders withexceptional skills. Lighting is exceptional throughout the master suite with cool LED overhead lights, all dimmable from switches at the head board. 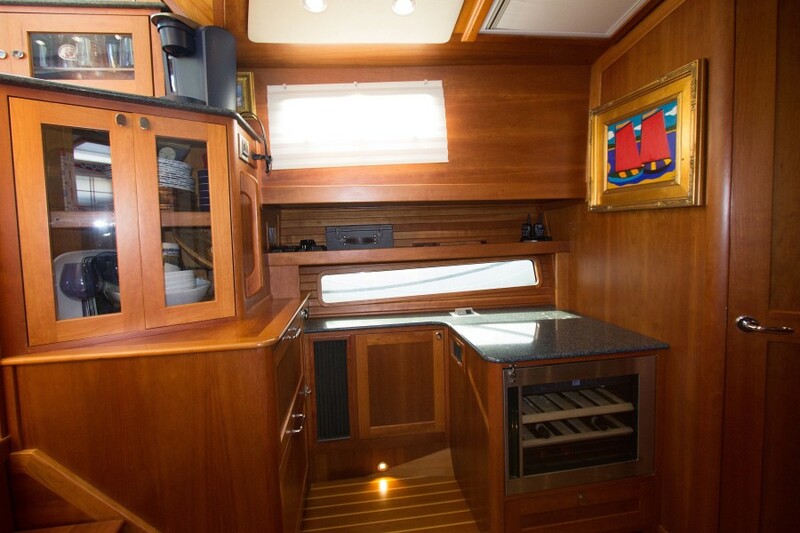 A flat screen LED television and DVD player are conveniently located on the bulkhead opposite the master berth. 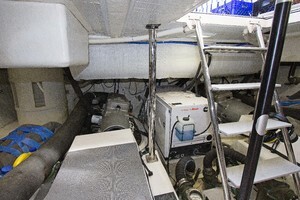 Many drawers are located in the aft master stateroom bulkhead and hanging lockers are found on each side of the berth. 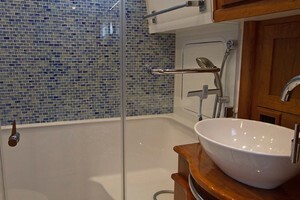 In addition, there are four large drawers under the berth.The master head and shower feature a ceramic tile floor, a sink with designer faucet mounted on an elegant high-gloss cherry vanity, a rain shower head in the glass enclosed shower and glass tile décor on the walls of the shower.The VIP stateroom forward is another luxurious and welcoming space. 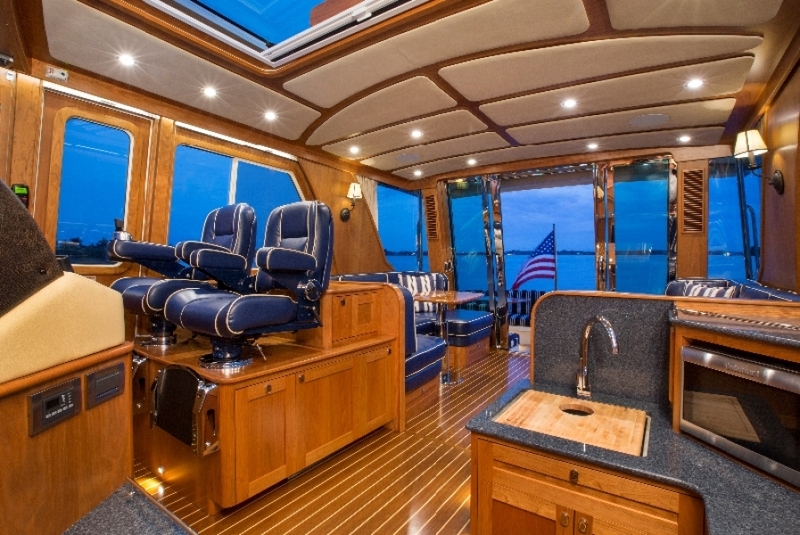 An island berth is placed low to the cabin sole for easy access. Multiple drawers, lockers and storage spaces are provided for all of your guests' gear and personal belongings. 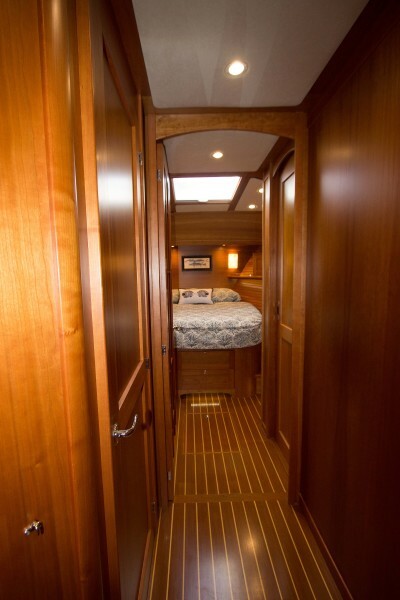 A cedar lined hanging locker and storage lockers above the berth exhibit the fine woodworking details for which Sabre is known. This berth also lifts to open up large volume storage space below. 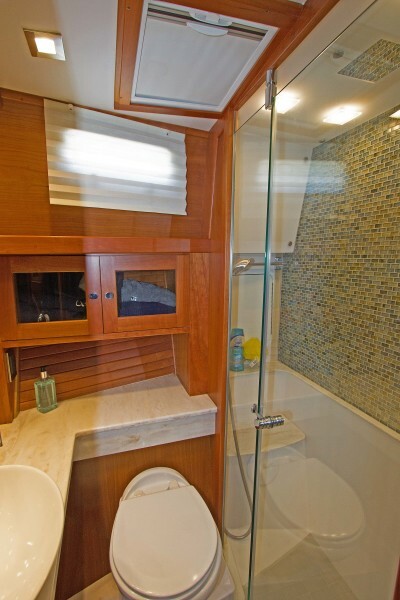 Guests will enjoy the comfort of a private head with stall shower, and ceramic tiled flooring under foot.Aft of the VIP stateroom to port is a third stateroom equipped with over/under bunk beds. The bunk room offers comfortable sleeping for two and is equipped with its own built‐in television, DVD player, hanging locker and reverse cycle air‐conditioning system.The exterior spaces of the Sabre 54 Salon Express are a crew's dream. 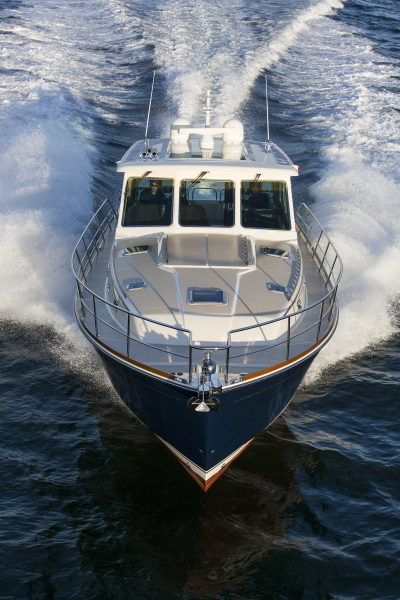 From stem to stern, every detail has been thought out with safety and ease of maintenance in mind. 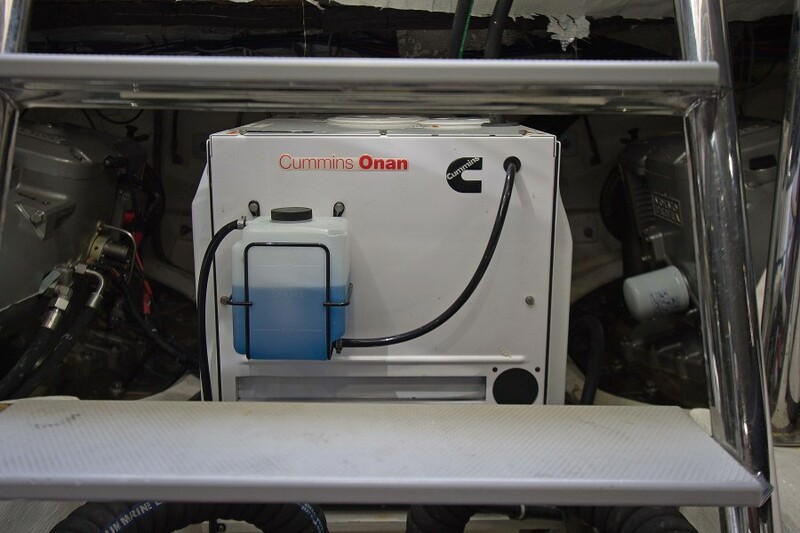 Hardware has been carefully chosen for quality and reliability. 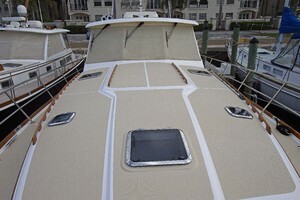 At the bow, a custom anchor roller provides the tools required to easily launch and recover two anchors.Fresh and salt water wash downs are located there for cleaning the ground tackle and all of this gear is recessed into the foredeck so that debris from the anchor and chain can drain below deck rather than down the side deck.Perimeter rails are heavy duty 316 stainless steel tubing, sized for maximum security. Hand rails are found at every point from the bow to the cockpit. Underfoot, a molded‐in diamond non‐skid pattern and a wooden toe rail make footing safe and secure. 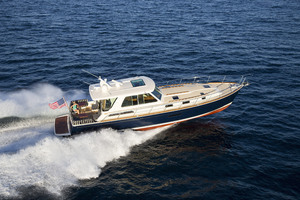 Along the side deck and below the hard‐top overhang is a sturdy hand rail, and at the cockpit steps, another vertical hand hold is placed perfectly for side boarding from a dock. The spacious cockpit with center transom door offers two L‐shaped settees each with a hi‐gloss table. 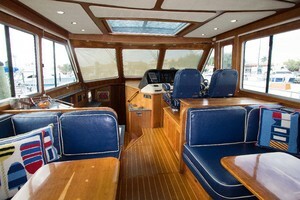 In addition, there are two aft facing seats. A Sure‐Shade cockpit awning extends to the transom to provide shade to the cockpit.New cockpit seating fabrics March 2018.The salon is entered from the cockpit through double stainless steel framed sliding doors. First impression is one of the light and brightness of the salon. With large surrounding windows and an electrically controlled sunroof overhead, the sense of space is dramatic and inviting. 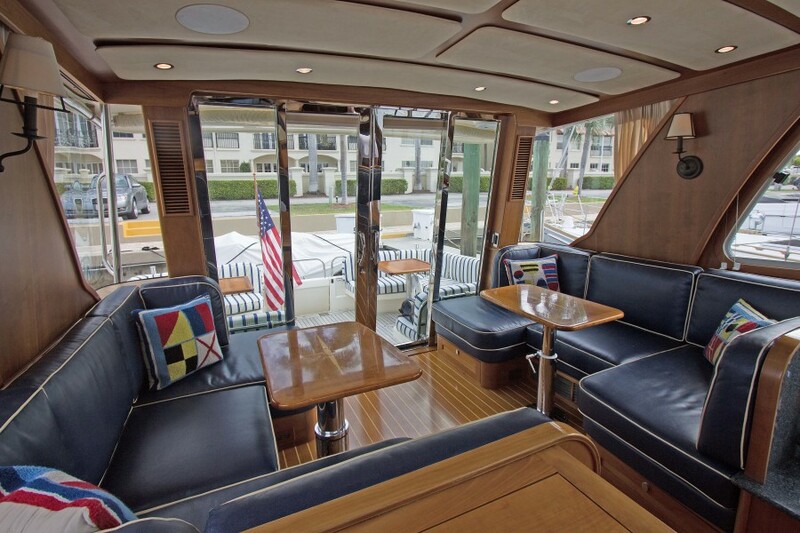 To port and starboard are luxurious U‐shaped Ultra‐leather settees and beautiful cherry wood hi‐lo tables with an elegant high gloss finish. 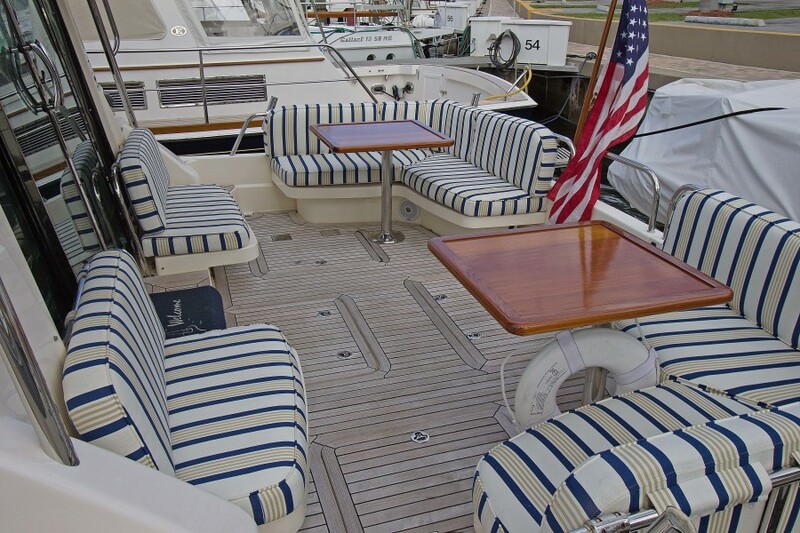 The starboard table raises and lowers electrically. 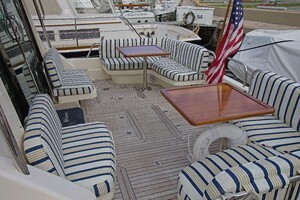 The starboard settee can be converted to an additional double berth. 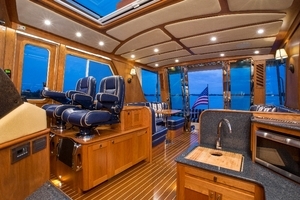 At the helm station twoStidd helm chairs are mounted on a cabinet containing an icemaker, glass and bottle storage and a large LED television on an electric lift. 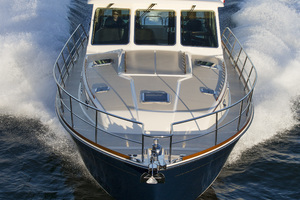 Outboard of the helm is a weatherproof, hinged door providing direct access to the side deck from the helm station. The navigational instruments pod is large and offers adequate space for multiple screens as well as the Volvo Penta engine controls. 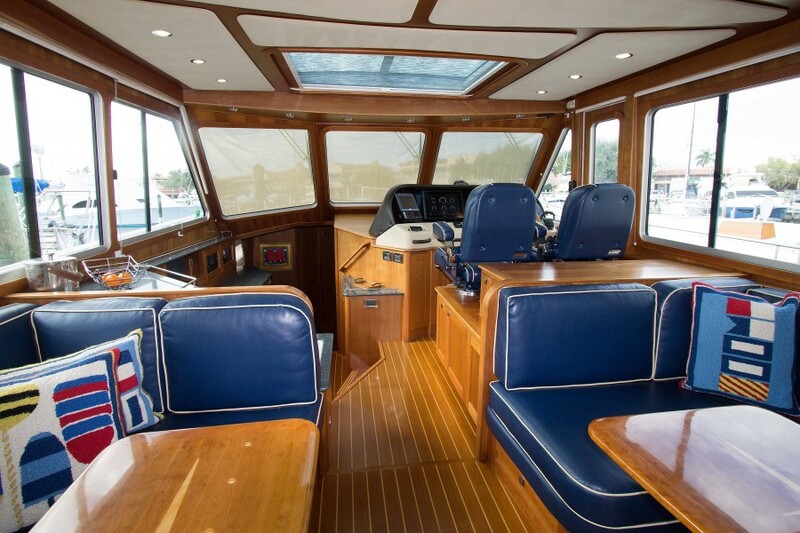 The Volvo Penta joystick is mounted on the helmsman’s armrest.The unique galley is laid out on two levels. 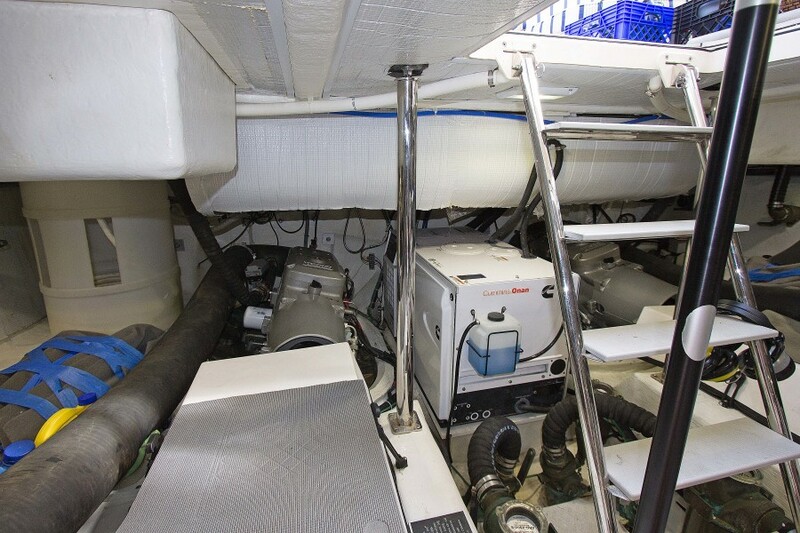 The upper level is directly connected to the helm, main salon and the social center of the yacht while the lower level offers additional refrigeration and freezer capacity as well as additional storage. Her galley offers an electric induction cooktop, deep stainless‐steel sink with designer faucet, Fisher Paykel dishwasher and four Sub Zero fridge/freezer drawers. Countertops are created from Viatera quartz.Forward of the galley to starboard, the master suite is accessed through double Shoji style passageway doors which open to a large and welcoming stateroom. 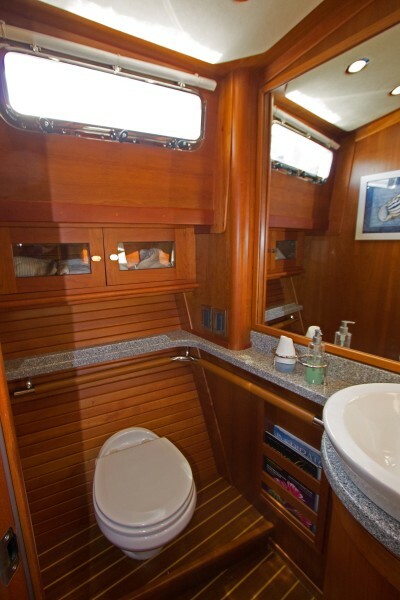 The master cabin is amidships, where wave noise and motion are at a minimum. 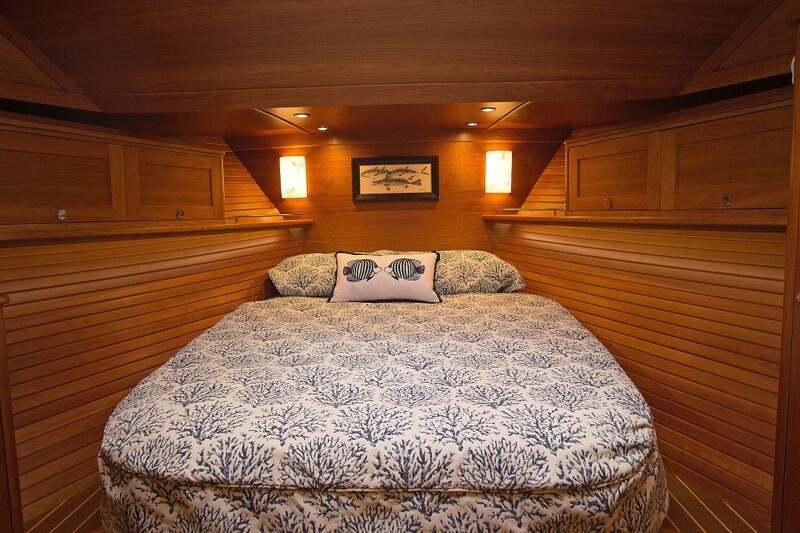 A hull port above the head board allows light from the water to reflect into the cabin, where a comfortable queen‐sized berth is surrounded by wood working details that can only be created by boat builders withexceptional skills. Lighting is exceptional throughout the master suite with cool LED overhead lights, all dimmable from switches at the head board. 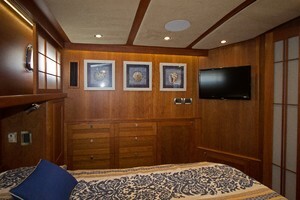 A flat screen LED television and DVD player are conveniently located on the bulkhead opposite the master berth. 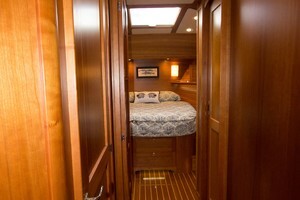 Many drawers are located in the aft master stateroom bulkhead and hanging lockers are found on each side of the berth. 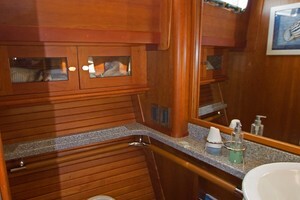 In addition, there are four large drawers under the berth.The master head and shower feature a ceramic tile floor, a sink with designer faucet mounted on an elegant high-gloss cherry vanity, a rain shower head in the glass enclosed shower and glass tile décor on the walls of the shower.The VIP stateroom forward is another luxurious and welcoming space. 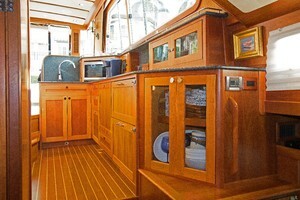 An island berth is placed low to the cabin sole for easy access. 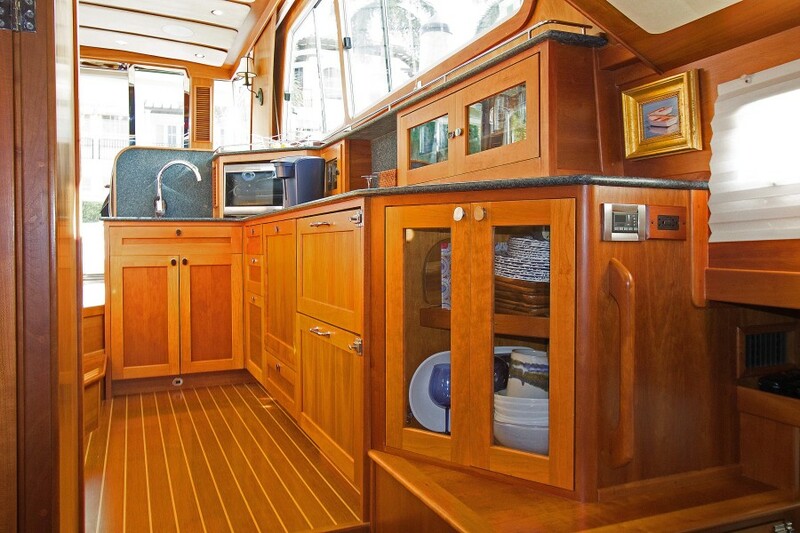 Multiple drawers, lockers and storage spaces are provided for all of your guests' gear and personal belongings. 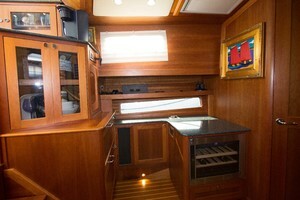 A cedar lined hanging locker and storage lockers above the berth exhibit the fine woodworking details for which Sabre is known. 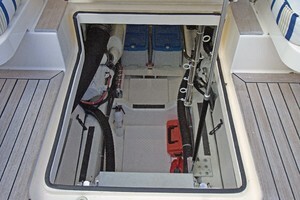 This berth also lifts to open up large volume storage space below. 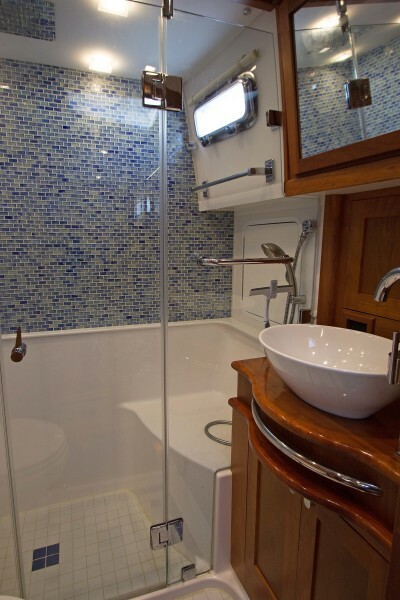 Guests will enjoy the comfort of a private head with stall shower, and ceramic tiled flooring under foot.Aft of the VIP stateroom to port is a third stateroom equipped with over/under bunk beds. 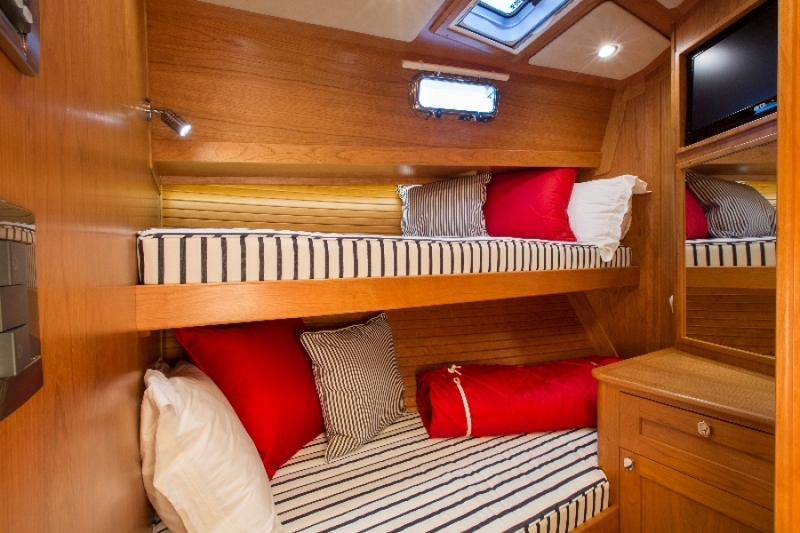 The bunk room offers comfortable sleeping for two and is equipped with its own built‐in television, DVD player, hanging locker and reverse cycle air‐conditioning system.The exterior spaces of the Sabre 54 Salon Express are a crew's dream. 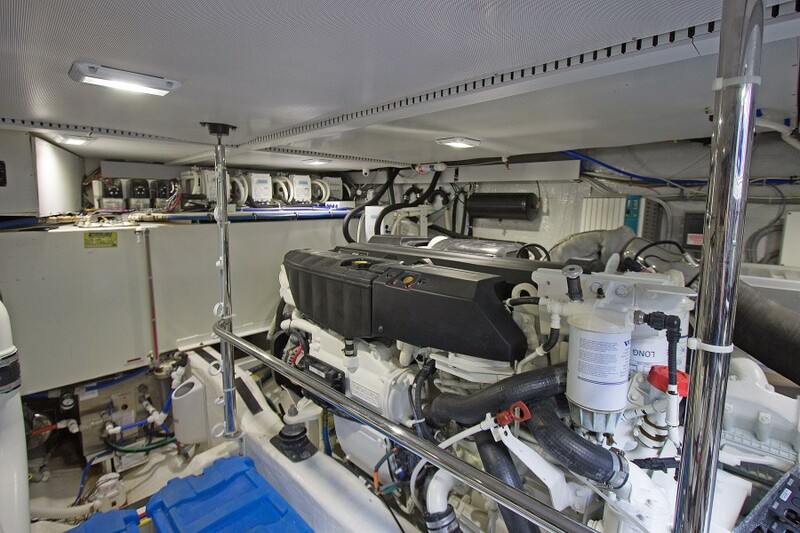 From stem to stern, every detail has been thought out with safety and ease of maintenance in mind. Hardware has been carefully chosen for quality and reliability. 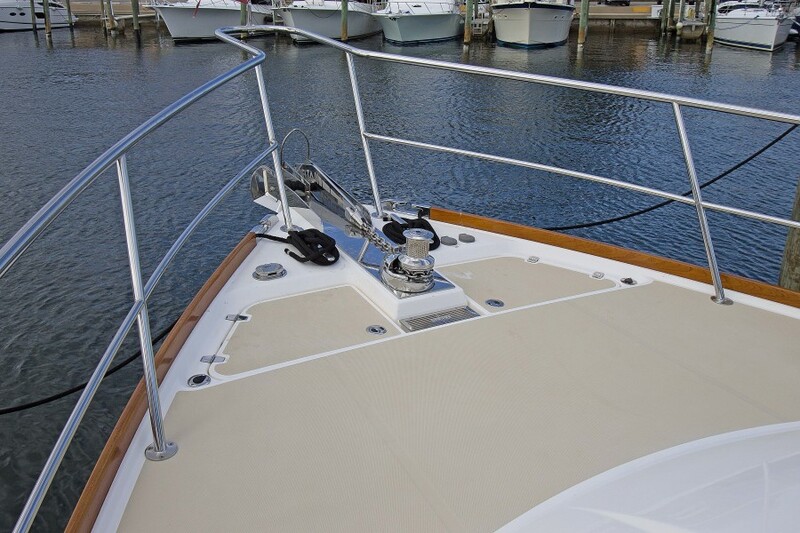 At the bow, a custom anchor roller provides the tools required to easily launch and recover two anchors.Fresh and salt water wash downs are located there for cleaning the ground tackle and all of this gear is recessed into the foredeck so that debris from the anchor and chain can drain below deck rather than down the side deck.Perimeter rails are heavy duty 316 stainless steel tubing, sized for maximum security. Hand rails are found at every point from the bow to the cockpit. Underfoot, a molded‐in diamond non‐skid pattern and a wooden toe rail make footing safe and secure. Along the side deck and below the hard‐top overhang is a sturdy hand rail, and at the cockpit steps, another vertical hand hold is placed perfectly for side boarding from a dock. 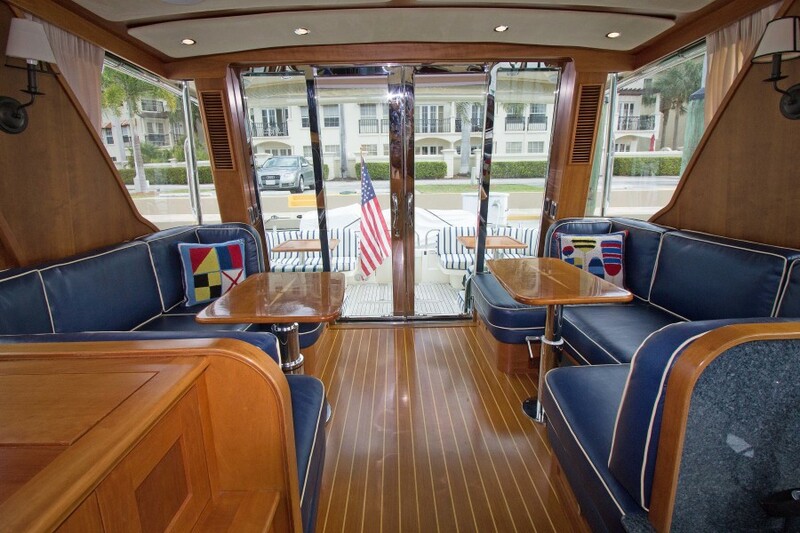 The spacious cockpit with center transom door offers two L‐shaped settees each with a hi‐gloss table. 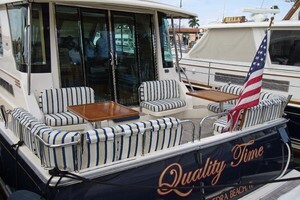 In addition, there are two aft facing seats. 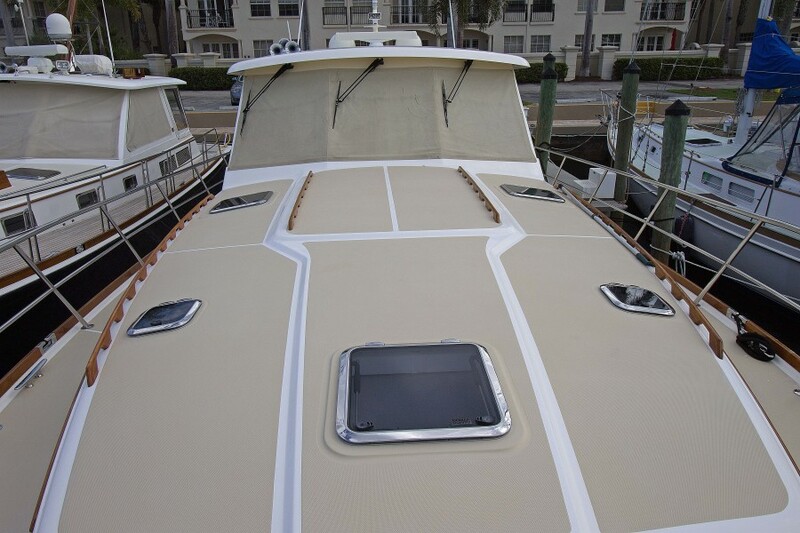 A Sure‐Shade cockpit awning extends to the transom to provide shade to the cockpit.New cockpit seating fabrics March 2018.